Along with tomatoes and peppers, nasturtiums were one of the treasures brought to Europe from South America by early plant explorers. The whole plant was eaten by the Incas as a salad vegetable, but it was the exotic flowers, and the ease of breeding new colours, that pushed the popularity of nasturtiums. 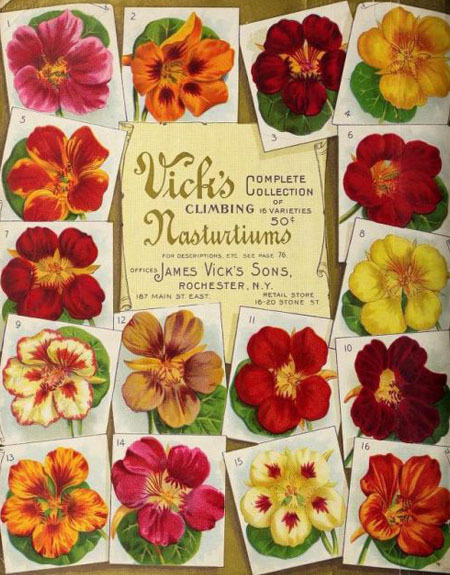 King Louis XIV had them planted at his palace at Versailles, and three centuries later seed catalogues began offering nasturtium varieties by the dozen. The early 1900s were the heyday of garden nasturtiums, but today they are making a comeback for several reasons. Beautiful, easy to grow and available in a range of types and colours, nasturtiums produce tasty edible flowers and do double duty as trap crops for cabbage white caterpillars and black bean aphids. Nasturtium seeds are as big as dried peas, so they are easy to handle and often recommended for children’s gardening projects. I like starting the seeds in small pots so I can quickly set the plants where I want them to grow, but direct-seedling will work provided you keep the soil moist for a week. Be adventurous in your choice of varieties, which vary in growth habit and flower color. Smaller varieties like ‘Little Gem’ are great in containers, and the white variegated leaves of ‘Alaska’ are especially interesting when viewed up close. Varieties called climbing nasturtiums can be trained to cover a fence or tumble down a wall, while standard selections grow into teeming mounds. It’s easy to make a case for growing nasturtiums among your vegetables. They may repel some cucurbit pests when grown near cucumbers or squash, and nasturtium leaves and stems forms a lush green groundcover that deters weeds. Bees eagerly gather nasturtium nectar, which is hidden in the long spur at the back of the flower. The striking petal markings in varieties like ‘Peach Melba’ or ‘Orchid Cream’ are intended to point pollinators to the flowers’ centers. ’Peach Melba’ nasturtiums are used here to deter pests from cucumbers. In most gardens in most years, nasturtiums will sail through their long bloom time with few problems from pests. However, in places where cabbage white butterflies are present while cabbage family crops are absent, the cabbage whites will often lay their eggs on nasturtiums instead. This often happens late in the season, which provides a unique opportunity to intervene in the cabbage white butterfly’s life cycle by dispatching caterpillar-infested plants to an enclosed composter or active compost pile. Cabbage white caterpillars are incapable of seeking out new host plants, so they perish along with the nasturtiums. In Europe, the Pacific Northwest, and many other cool temperate climates, nasturtiums may become infested with tiny black aphids that are so small that it almost looks like dark soil has splashed onto leaf undersides. Commonly called black bean aphids or blackfly, many gardeners find early infestations easy to spot and terminate on nasturtiums compared to the aphids’ favourite plant, broad beans. With nasturtiums, you can pick off infested leaves, stems and branches and chop them into a compost pile. This is less traumatic than when the aphids are on your beans, poppies, or dahlias. ’Alaska’ and a few other varieties feature leaves variegated with white. Edible nasturtium blossoms are great for bringing lively colour to the plate, and they contain as much vitamin C as parsley, and more lutein than tomatoes. Even if all you do is toss them into a smoothie, nasturtium blossoms are good for you. Gather newly opened flowers in the cool of the morning, and store them in roomy plastic bags in the refrigerator for up to two days. Just before using them, pinch off the back of the flower to remove the spur and center, which often taste bitter. The petals are the best part. Nasturtium leaves have a spicy, watercress-like flavour, and they make interesting greenery for lining serving plates, or you can chop small amounts into summer salads. Some people dry the leaves and use them to add colour and peppery flavour to homemade seasoning salts. Or, you can blanch them and puree them into nasturtium pesto. The plump immature seeds can be pickled, but like nasturtium leaves they contain high levels of oxalic acid, and should be eaten only in small amounts. "Thanks for broadening my nasturtium horizon, Barbara! Learned so much from this post." "Will squirrels leave them alone? I've the perfect spot, but it's not squirrel proof. Thank you. " "Kathy, if you protect the plants while they are young with a chicken wire cover, you should be able to grow nasturtiums in the company of squirrels. Other possibilities include geraniums, marigolds or petunias. Good luck!" "thank you for sharing information, very useful for me. "